Owning a laundromat can be a profitable business, but there are a few mistakes that you might find that you make when getting started. These can be avoided if you follow a few simple tips while keeping customers happy at the same time. If you want to appeal to more customers, then you need to offer more than just washing machines and dryers. Talk to people in the area to find out what they want while at the laundromat. Some might want a snack or drink machine while washing clothes while others might enjoy a few arcade games to pass the time. When you find out what will keep people inside the laundromat, then you will likely find that they will spend more money when they are there. The options offered should be a reflection of the age group that you serve and the income level of the people who use the services provided. When you get into the laundry business, you might expect to offer multiple services, such as doing the cleaning for businesses who have towels, bedding and cloth napkins. While doing the laundry for businesses can mean more money, you need to make sure you have the equipment and supplies that are needed for a professional job. Check the water to see that it’s at the right temperature for getting clothes as clean as possible. You also want to use the highest quality of products that you can comfortably afford so that items are thoroughly cleaned. If you can’t provide this kind of service, then it might be wise to explore other services to offer customers. 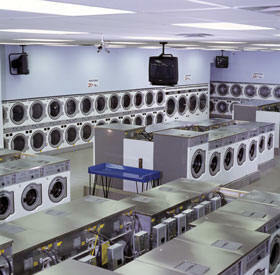 Most people think that a laundromat is simply having washers and dryers so that people can deposit coins to do laundry. While this is the basic concept, you also need to think about the overhead and some of the products that are offered to those who leave detergent and other supplies at home. You will have to take the time to clean all of the machines, emptying the filters on a frequent basis so that all of the machines function. If something breaks down, then you will need a way to fix the problem. Floors need to be cleaned as well as a bathroom area for customers. These are some of the things to consider that aren’t as simple as they seem. While there are some laundromats that might not be expensive to purchase, especially if someone is selling because they are retiring and aren’t looking for a big profit, most businesses will cost a good bit to get started. One of the mistakes that many make is not setting aside enough money to really get the business going. You will need money for the rent, taxes, licenses that are required and the transfer of utilities to your name. One of the common mistakes that owners make that could be costly in both finances and the personal life is spending too much time at the laundromat. You need to set hours that are ideal for customers but that are also workable with your own life. If you need to spend more time at home or at another job, it would be best to hire someone to work part-time, but you need to make sure it’s in the budget to pay this person. A laundromat is usually an easy business to operate. You can set your own hours and pay attention to the details of the business that you want customers to appreciate. However, there are a few components that you need to look at in order to save time and money so that you see a profit instead of a loss.